20% off every 5th order. Plus never forget! Equitop Myoplast is a dietary supplement geared at developing lean muscle mass in competition horses through a concentrated source of valuable nutrients. Pharmaceutical grade in a bio-available form, Equitop Myoplast is both safe and highly effective when used regularly. Sport and show horses, as well as young horses in training, can benefit from all Equitop has to offer, including its careful blend of iron and 18 essential amino acids (L-Lysine, L-Threonine, DL-Methionine and L-Tryptophan included) to reconstruct new muscle and condition existing tissue. Most of our customers report seeing a marked difference in their horses between 2-4 weeks and 93% would use Equitop Myoplast again. 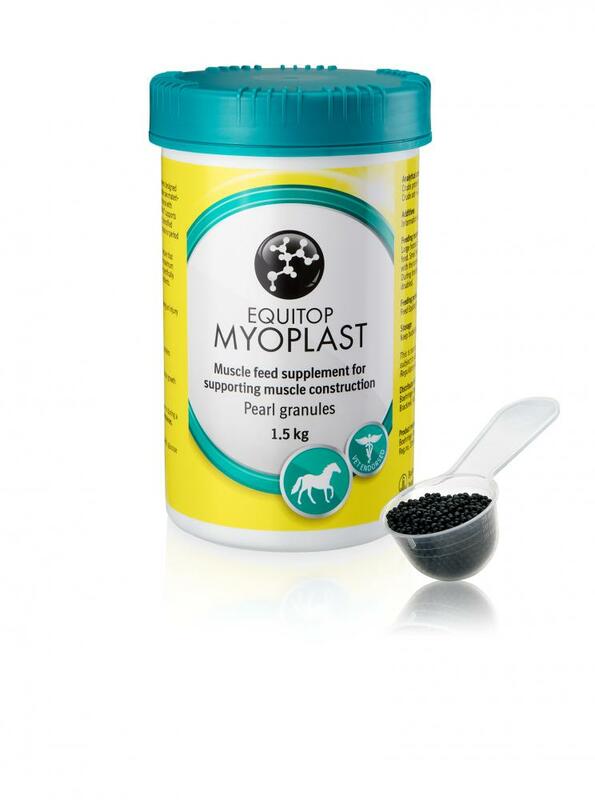 Equitop Myoplast is supplied with a 25g scoop. The daily dose is one scoop per day for a horse under 500kg bodyweight, and 2 scoops for horses over 500kg. However it is safe to give a higher dose for horses during intensive training or competition. Always check with your vet if in doubt. Results should be visible within 3-4 weeks. Algae powder (Spirulina platensis) 40%, Saccharose, Glucose syrup, Corn starch. The following amounts should be mixed with the horse's main feed once per day. Myoplast should be used for the minimum of a 4 week period. Equitop Myoplast can be fed at a maintenance level all year round, feed half the recommended amout above. Below are some recent questions we've received regarding Equitop Myoplast for Horses, including answers from our team. Is this product safe to feed a horse with EMS and Cushings? What is the sugar content in one scoop? It would be best to check with your own vet before adding anything to your horses diet. However the manufacturers suggest that Myoplast is safe to feed to horses with Cushings or EMS. It is primarily a protein supplement with only a very small amount of sugar so should not cause a problem. How does Equitop Myoplast fit in with the horse's general feed regime? Does it replace a feed balancer for example? Myoplast is designed to be added to the main feed as an extra. It would be best to continue a balancer which will provide essential nutrients for general health where Myoplast is geared towards developing muscle. Is this product FEI approved? Is this product BE and FEI approved? Yes this product is competition legal. You are doing a lot of things right but if you are still struggling to get condition on her it is safe to increase the dose of myoplast to 2 scoops. You could also increase her calorie intake by giving a larger feed twice a day or feeding 3 times a day. Doing hill work with her whilst you are out hacking will help her to build up muscle along with pole and cavaletti work more than just jumping once a week... Other than that make sure she is up to date with worming and her teeth have been done. You can set up a regular delivery using a credit or debit card. I would suggest you do this. You can choose whatever frequency of delivery you would like. Payment is taken at the time of each delivery from the card you choose. I have a pure breed Arabian 8 month old Colt foal and would this be safe to use on him and in what sort of dosage? This product is perfectly safe for your horse and I would give the normal amount, which would be one scoop per day. Equitop Myoplast will be a brilliant product to feed your mare to help with muscle development. This product is like when athletes take protein shake to feed their muscles after training, Myoplast works in the same manor. It is made up of essential amino acids, any deficiency in these amino acids can limit protein production in the body. Why would this be good for a horse coming back into work/on box rest? This is because protein is needed to repair body tissues and aid recovery. It also will stop too much muscle lose whilst your horse is not in work. It has a balance of nutrients of fibre, protein and carbohydrates, as well as vitamins and minerals. This will all help aid healing process by supporting muscle function, digestion, immunity and respiratory health. Myoplast is a non heating supplement, so should effect your horses mood, however if your horse is building muscle they are naturally going to feel stronger. It is important to feed along side a high fibre and low starch diet, feeding concentrate feeds little and often. Also make sure your horse has plenty of high quality clean forage. My horse is allergic to wheat so has a diet of Alfa A, succulents, and a vitamin and mineral supplement. He is a (very) good doer, and is a dressage horse working at Advanced Medium level. I'm concerned that he isn't getting enough protein for the work that he is doing, but need to give him a supplement that won't put a lot of weight on him or trigger his wheat allergy! Is Equitop Myoplast suitable for him? This should be the ideal product as long as your horse is just sensitive to wheat and is not affected by corn (maize). There is no wheat used in Myoplast but there is corn. He will probably be fine with it, but sometimes a horse can react to both these types of cereal. You would have to try a small amount to find out. Yes, it is a premium quality, 100% natural feed supplement derived from algae, certified “non doping” and can be used prior to, during and after competition or racing. Can it be fed to yearlings and young stock? There is no particular age of which you can introduce this product as long as they have been weaned.